Not only did this third award ceremony mark great achievements, but it marked our 10th anniversary. And anniversaries are significant. Our 10th anniversary coincides with the 60th anniversary of the women’s march, the 40th anniversary of June 16 and the 20th anniversary of the Constitution. These are all significant events and we are proud to be able to place amongst them ourselves and the attorneys, advocates and others who do such important work. 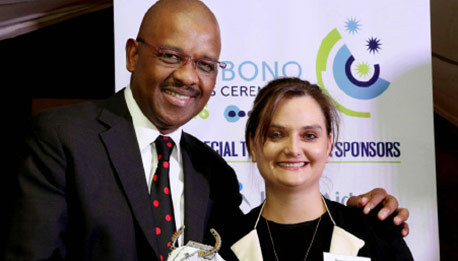 This year’s guest speaker was Dali Mpofu SC, Vice-Chairperson of the Johannesburg Bar Council. He mentioned the new Legal Practice Act presently being implemented, where pro bono work is being addressed in the category of community service. Only a small percentage of South Africans can afford even the most basic legal services and without such services the values in our Constitution of equality, the rule of law and the restoration of human dignity cannot be realised. He added that if the profession gets the exercise right, it would go a very long way in addressing the present frustration experienced by the poor and economically disadvantaged, who are mostly black people, women and other economically vulnerable groups. He also stressed the importance of all legal practitioners doing pro bono work and congratulated those who had been nominated as finalists. It was very pleasing to see a marked increase in the participation of small law firms in the awards this year. Webber Wentzel – for the Southern Africa Litigation Centre and the Helen Suzman Foundation in the matter of the failure of the South African government to arrest Sudanese president Omar Al-Bashir when he visited the country in June 2015. Hogan Lovells – for the police brutality legal clinic it runs in conjunction with ProBono.Org. 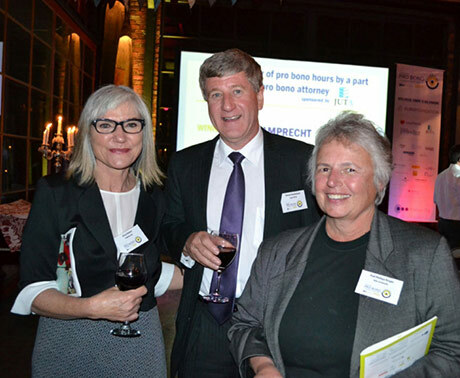 Norton Rose Fulbright SA– for the Arthurstone Village Community. The Amashangana Tribal Authority case which restored land to a community evicted by a tribal authority. Cullinan & Associates, Cape Town – for an environmental case involving the rights of AmaPondo communities on the Wild Coast. 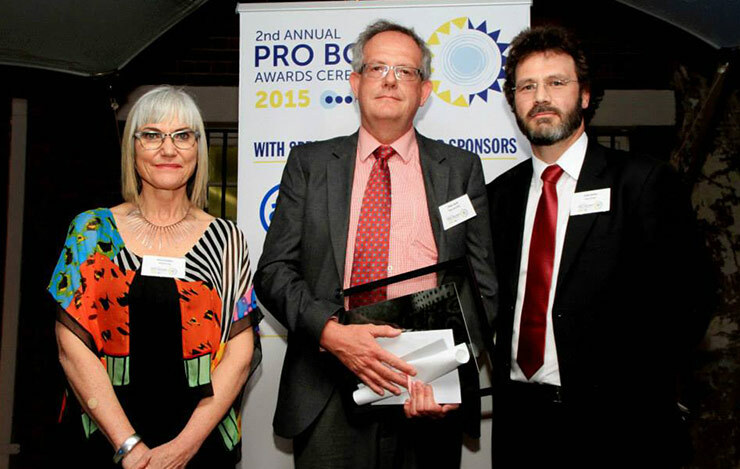 Garlicke & Bousfield, Durban – for their work with the ProBono.Org office in Durban. 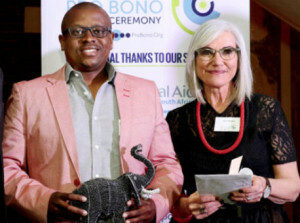 David Masilela – for his work with community advice offices and at help desks, and training of practitioners on areas of law affecting poor and vulnerable people. Congratulations to the winner, Cullinan & Associates. Fasken Martineau – for the domestic violence, refugee and housing matters it took on in 2015. Cliffe Dekker Hofmeyr – for its work at the ProBono.Org Refugee Legal clinic and several high profile matters. Hogan Lovells – for its partnership with Probono.Org at the Police Brutality Legal Clinic and its involvement in clinics dealing with the rights of women and children. 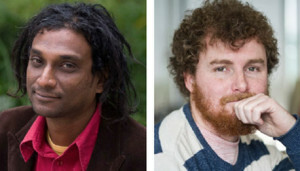 This award went to media players who advanced social justice through their work. There were two winners in this category – freelance journalist Niren Tolsi , and Sipho Kings, environmental reporter for the Mail & Guardian. Isabel Goodman. Advocate Goodman appeared in the Al-Bashir matter mentioned above and acted for the Legal Resources Centre in a matter interdicting a mining company from entering community land and threatening people (part of a larger dispute relating to the attempt by an Australian mining company to mine titanium along the Wild Coast). Donrich Jordaan. During 2015, he acted as counsel in a number of cases on a pro bono basis that involved cutting edge legal developments including the law on surrogacy. Luke Kelly was selected for his outstanding contribution to the work of Corruption Watch over the last three years. In the EFF and DA cases against the National Assembly the powers of the Public Protector were clarified in what could be considered to be a landmark decision. The winner was Isabel Goodman. The Juta award to a student at a university law clinic. This award celebrates the dedication and commitment of students in assisting poor and vulnerable people. 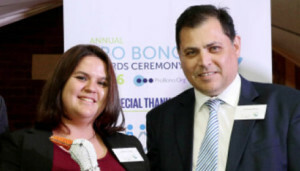 LASA selected a pro bono practitioner or service provider that showed dedication and commitment to undertaking pro bono work for Legal Aid SA during 2015. The practitioner award went to Tsepiso Matubatuba. 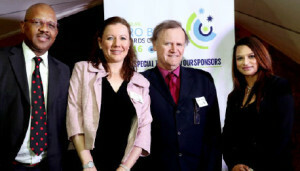 The service provider award was given to DNAbiotec®, which offers Awards finalists a screening service to legal professionals for section 212(4) (a) affidavits containing DNA evidence. The firm formalised this into an official pro bono service for Legal Aid South Africa a few years ago. 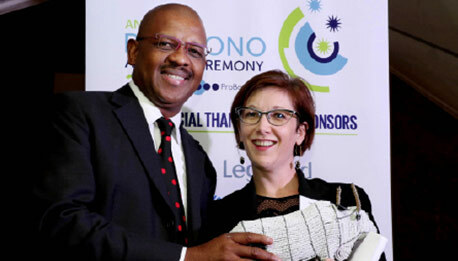 LSNP President, Anthony Millar, presented the LSNP award to Juvon Prinsloo, who has taken on pro bono matters enthusiastically since opening her own firm. Ngwako Raboshakga, coordinator of the Alexandra Law Clinic run by ENSafrica. This clinic offers an invaluable legal service to residents of Alexandra. Bricks Mokolo for his work in the community advice office sector, particularly at the Orange Farm Human Rights Advice Centre . Henk Strydom who spends many pro bono hours and days on emotionally draining children’s matters and has taken on almost 40 cases during the past four to five years. 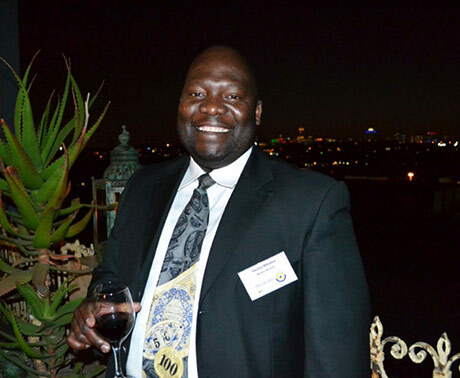 Baitseng Rangata of Maponya Attorneys for the many hours of work undertaken for communities in and around Pretoria. 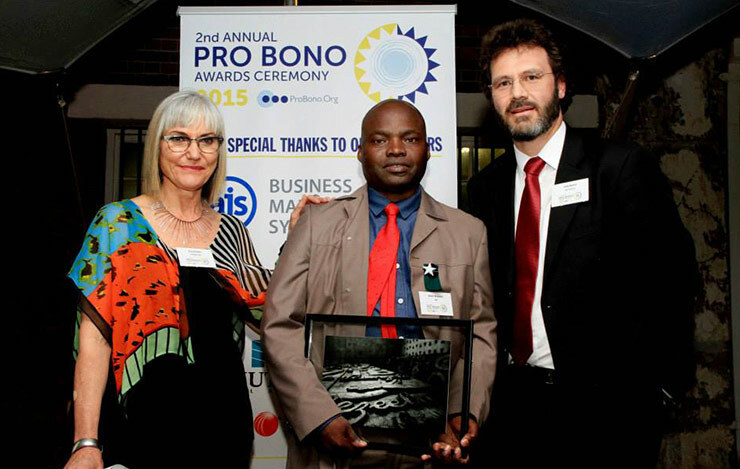 Jeff Phahlamohlaka of Bowman Gilfillan – for his legal clinics, outreach work and SMME development work. Advocate Kate Hofmeyr, who has undertaken cases involving hate crimes and attempts to muzzle the press amongst many others. At this year’s awards, we launched a new initiative to highlight the work of NGOs doing significant social justice work. We have dedicated a page on our website to their stories and we invite you to visit NGO Links on the site and see the important work that they are doing, ranging from environmental activism, protection of abused women, the right to education and strategic litigation on human rights and the rule of law. We hope to add more of these stories on the page as time goes on. 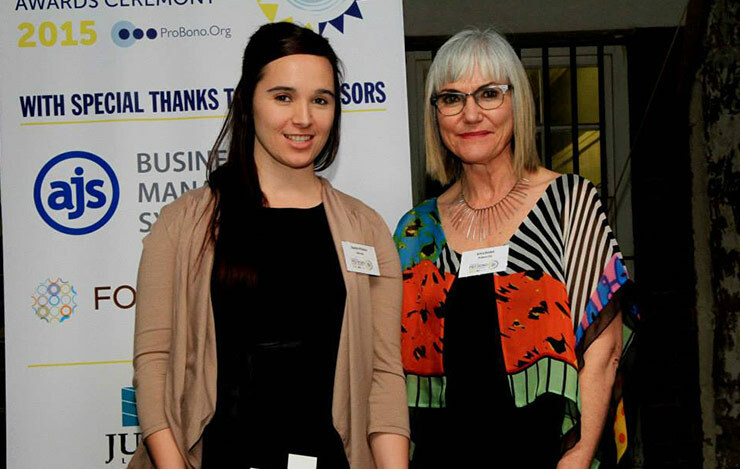 Our major sponsors this year were Legal Aid South Africa, the Law Society of the Northern Provinces and Juta. Our other generous sponsors were Spoor & Fisher Attorneys and AJS Business Management Systems. LexisNexis and without prejudice provided financial as well as inkind trade sponsorship. Auditors Grant Thornton once again audited the nomination and judging process. Spier donated wine, and The Hill provided the venue free of charge. 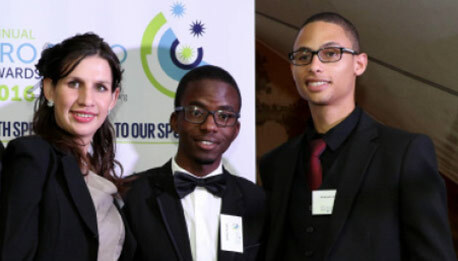 Michele Dean of Limeblue for the design work; Lloyd Piater of The Natural Agent for digital assistance, Freshly Minced for production assistance; and Yolanda van der Stoep for photography. 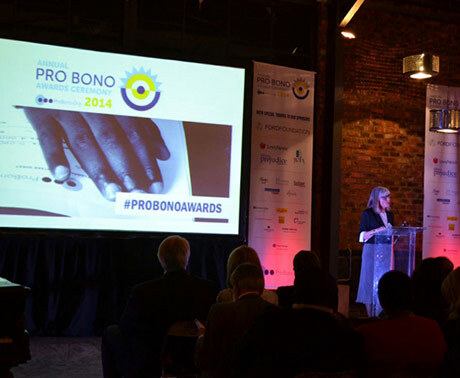 The very first Annual Pro Bono Awards Ceremony in South Africa was held at the stylish Katy’s Palace Bar in Johannesburg on 7 October 2014. 150 attorneys, advocates and mediators attended the event that was ably MC-ed by attorney and social media expert Emma Sadleir. 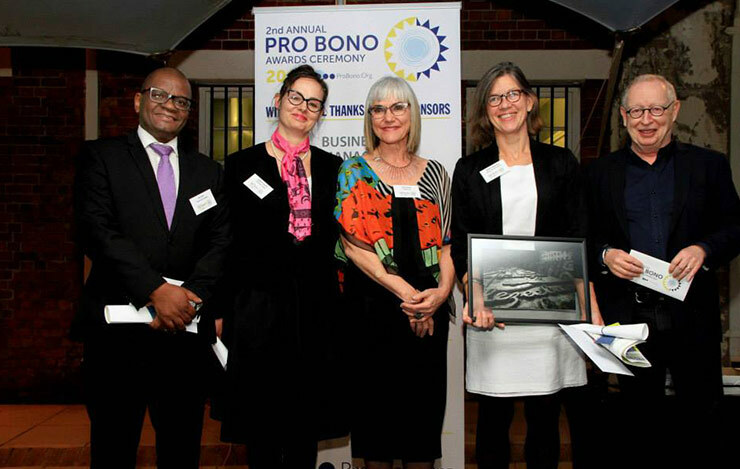 The event was held to recognise the impressive contribution made by pro bono attorneys (part-time and full-time), law firms and advocates to the lives of low-income people in South Africa. 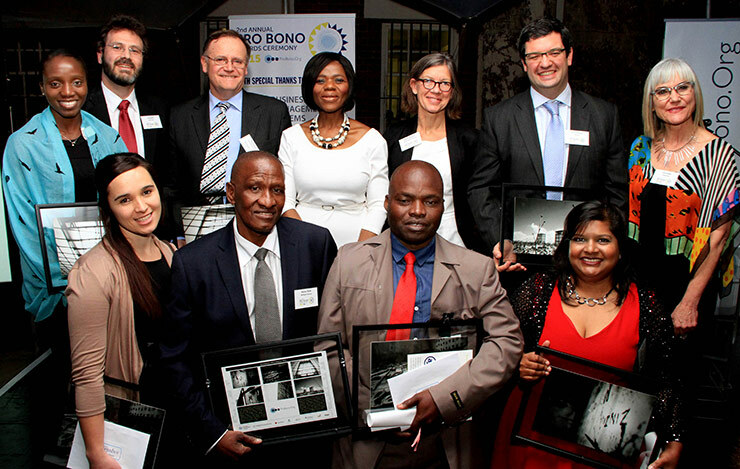 Journalists reporting on pro bono cases, drawing the public’s attention to cases that change the lives of the poor, were also recognised. The aim of the event was to honour and celebrate this important work and also increase and grow the involvement and commitment of the legal profession. Nic is the CEO of the Law Society of SA (LSSA) and the founder and director of Legal Aid and Development (LEAD), responsible for the professional training of attorneys. He is a member of various law faculties and sits on a number of boards. In addition, he practices as an attorney and mediator. 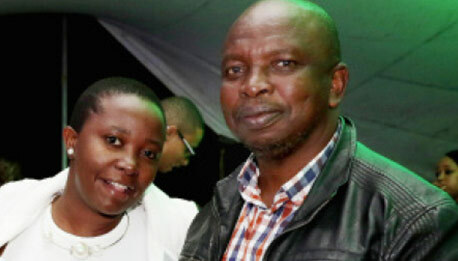 He holds BA LLB and B Com degrees from the University of Pretoria and UNISA. Alice is an international human rights advocate and an expert on the use of law for the public good. She has extensive experience in civil rights litigation and social justice philanthropy and currently advises, speaks and does research on public interest law, philanthropy, social justice and non-governmental organisational effectiveness. She was the director of the Ford Foundation (South Africa) for many years. She holds a law degree from New York University and history degrees from Dartmouth College and North-western University. Jonathan is a Professor of Law at Wits University Law School and is based at the Wits Institute for Social and Economic Research (WiSER). 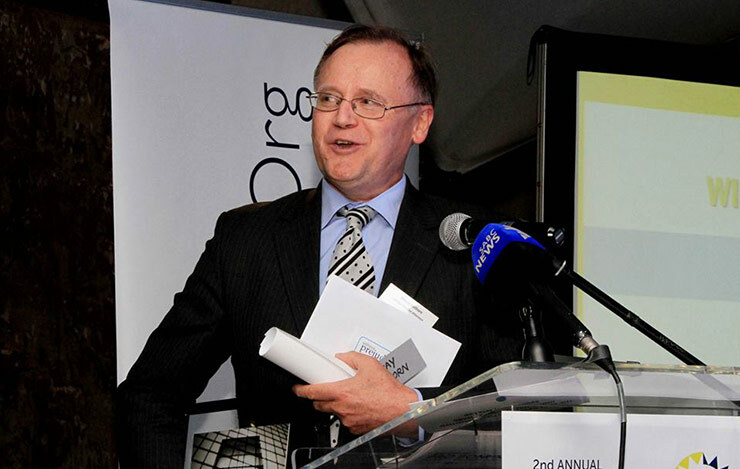 He served as Dean of the Wits Law School from 2010 – 2013 and as Director of the Mandela Institute from 2005 – 2007. He holds a PhD in sociology from Yale University and law degrees from Wits and Columbia Universities. Grant Thornton (previously Kessel Feinstein) is the fifth largest auditing, tax, outsourcing and advisory firm in South Africa, with 10 offices across the country. The 3 judges reviewed all nomination forms submitted. 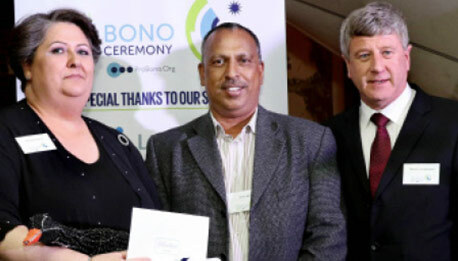 The awards were allocated on the basis of pro bono hours (firms, attorneys, advocates) and the number of words (media). The law firm hours were aggregated according to the number of professionals in each firm. The judging process and decisions were reviewed and audited by Grant Thornton to ensure non-partiality, fairness and correctness. Kathie Satchwell was a student activist at Rhodes University during the apartheid years, playing a support role for Steve Biko and other detainees. She practised as an attorney for 18 years, during which time she dealt with pass law courts with the Black Sash and CALS, representing detainees, political activists, prisoners and conscientious objectors. She appeared at the Truth and Reconciliation Commission, presenting a memorandum on human rights abuses. She was appointed to the bench in 1996, and since then has handed down many innovative and path-breaking judgements. She has had a long association with a number of NGOs (POWA, Black Sash, Learn and Teach and Media Defence Trust) and is currently a Trustee of the Nelson Mandela’s Children Fund. Fasken Martineau has a long history of involvement in pro bono work, initially during apartheid as Bell Dewar and Hall. 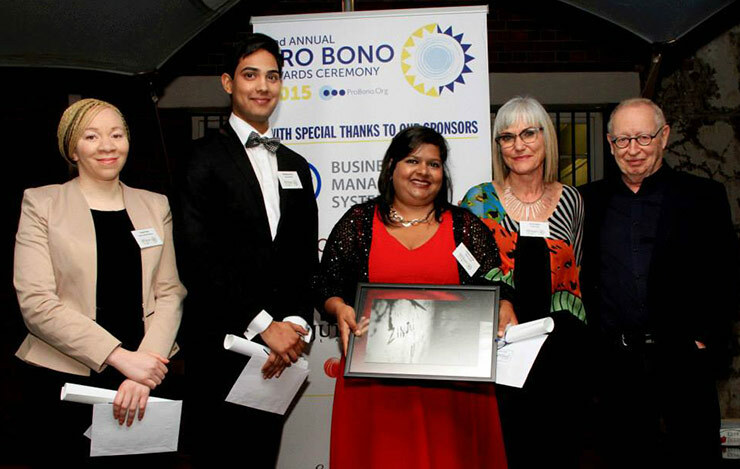 In 2010 a dedicated pro bono department was established. The pro bono department provides legal advice and representation in employment, housing, refugee, maintenance and domestic violence matters. All the attorneys in the firm participate in pro bono work. 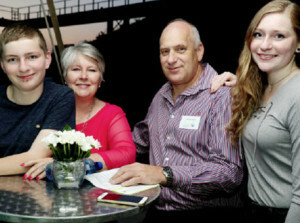 Norton Rose Fulbright SA sees itself as a firm with a commitment to social responsibility and human rights work. Its work in this arena dates back to the 1980s. The firm has consistently offered advice and legal representation, not only to low-income individuals and communities, but to non-governmental community based organisations, trusts, charities and foundations. 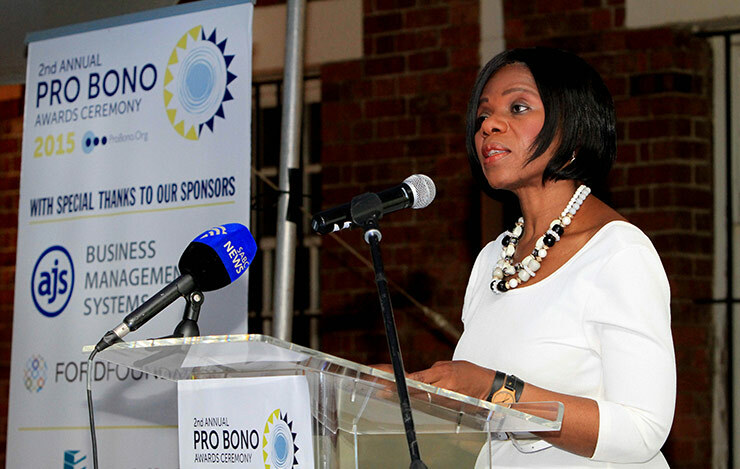 In 2003, Webber Wentzel established a pro bono department to provide free legal services to a variety of communities. 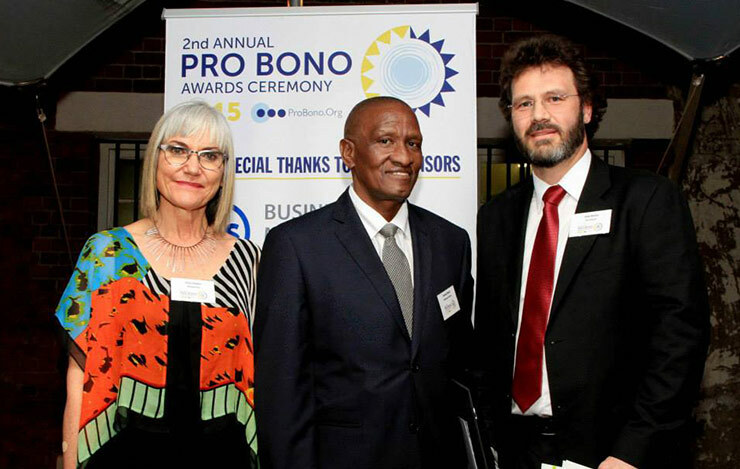 The pro bono practice provides legal services on issues related to land reform, housing, education, healthcare, children’s rights, gender equality and service provision. One of their core projects aims to secure constitutional equality for women. Mervyn Taback Inc’s pro bono work covers labour matters and including litigation, arbitration, the drafting of documents and appearing in court and tribunals for clients. In 2013 the firm successfully litigated against the Ford Motor Company South Africa, securing a favourable settlement for 13 former employees. Directors of the firm sit in court as acting judges on a pro bono basis. Schindlers Attorneys offers a range of services in legal areas including commercial, litigation, conveyancing, labour, intellectual property and consumer law. Schindlers has been working to save the Zoo Lake Bowling Club and as recently as September 2014 secured an order halting the eviction of the tenants. The firm represents Stobbs and Clark who are seeking to have medical marijuana legalised. Mabaso Attorneys deals exclusively with employment and labour law issues. The firm has been involved in a great many pro bono cases. Some have involved obtaining writs of execution in order to enforce compensation awards; others have involved opposing review applications. The firm has litigated against both private and government employers for their clients. Clarks Attorneys provides legal assistance in an array of family law matters. The firm staffs ProBono.Org’s Domestic Violence Legal Clinic at the Randburg Magistrate’s Court. In addition to staffing the clinic and representing pro bono clients referred to them by ProBono.Org, Clarks takes on matters referred to the firm by the Law Society of the Northern Provinces. Tricia Erasmus is a senior associate in the pro bono department at DLA Cliffe Dekker Hofmeyr. Her areas of expertise include refugee law, access to information, general High Court litigation, constitutional and human rights law. She has been instrumental in the case of SAHA and R2K v Minister of Police and Another, where she assisted the applicants in bringing a High Court review application in terms of PAIA to provide information on places or areas declared as a National Key Point Complex in terms of the National Key Points Act. Moray Hathorn was appointed to head the pro bono department at Webber Wentzel in 2003. Using constitutional and administrative law, Moray has guided the department to also take on cases related to gender based violence, traditional leadership, HIV discrimination in the workplace, post-restitution support to land reform beneficiaries and evictions. Moray and his team represented the Protea South informal settlement in eviction proceedings against the City of Johannesburg. The matter was heard by Justice Wright in the South Gauteng High Court and resulted in an interdict (to stop demolitions) and an order to provide interim basic services to the indigent households. Ayanda Khumalo is a senior associate in the pro bono department at Webber Wentzel in Sandton. She actively deals with issues related to socio-economic rights, administrative law, labour law, insurance litigation, non-profit organisations and refugees. Ayanda recently represented a vocal gay rights activist, Dr Semugoma facing improper deportation to Uganda and persecution under the Anti-Homosexuality Bill. The legal intervention by Ayanda ultimately led to Dr Semugoma being granted a specialised skills work permit in February 2014. 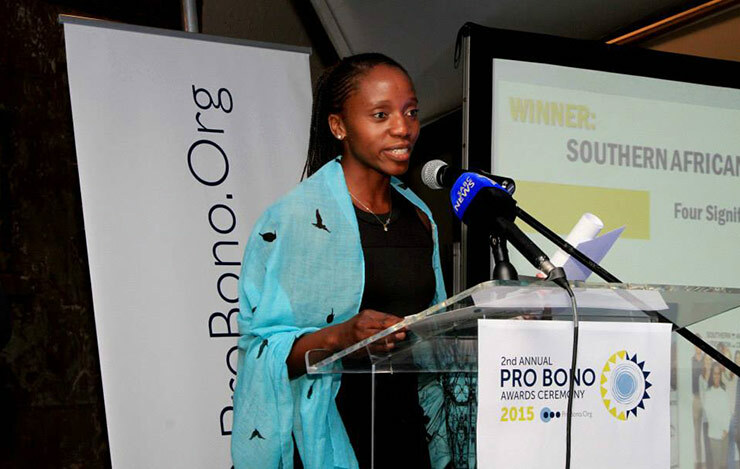 Despite working at a relatively small firm, Sandile completed many hours of pro bono work in 2013. Work of this volume for a small firm entails not only an enormous sacrifice of time, but also of financial resources. As a labour law specialist, Sandile took on many matters from the SASLAW advice office, staffing it regularly, making himself available on short notice, and offering assistance at the Labour Court. Pro bono clients have benefited from Tiny’s specialised knowledge of corporate law, through her work at Ishishini Lethu (a legal clinic for SMMEs) and for other NPOs. Tiny has also ventured out of her comfort zone, dedicating significant hours to family law, domestic violence and housing law, areas that go to the heart of the struggles of poor people in South Africa. Nadine is an advocate in Group One who serves on the group’s Pro Bono Committee. She is available to assist Cliffe Decker Hofmeyr on a regular basis in finding suitable counsel for their pro bono matters. Her areas of expertise include constitutional and human rights law, public and administrative law, labour, pension fund and media law. Emile is a junior advocate based at Pitje Chambers, Johannesburg. 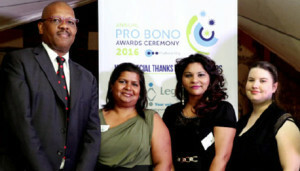 He has demonstrated remarkable commitment to pro bono work and has frequently been congratulated by judges, magistrates and other lawyers for his eagerness to assist on a pro bono basis. He has taken on numerous time-consuming intestate and estate related matters with a commitment to the children, widows and others left behind. Catherine is an advocate based in Johannesburg. She has assisted with a number of matters at the Pro Bono.Org Family Law Clinic. Her most notable case was related to the murder of Brenda Hedges by the estranged husband of the deceased’s daughter. Catherine worked tirelessly for over a year to obtain Domestic Violence Protection orders and to ensure that the accused was arrested and the matter brought to trial. The Legal Resources Centre nominated Victoria for her extensive, in depth and excellent coverage of all issues relating to children and the right to education. Her coverage of education cases, including the LRC’s class action against the Department of Education, Eastern Cape, has kept one of the greatest post-apartheid challenges in South Africa in the public eye. She writes regular columns on children’s rights, drawing attention to the multitude of problems faced by children. Shain ensured that ProBono.Org’s One-Child-a-Year campaign received the spotlight and was given good coverage in the press. He recently became involved in reporting cases handled by ProBono.Org and wrote an in-depth piece on one particular woman’s plight. Shain’s focus on the most vulnerable sectors of society and his detailed article, which went beyond reporting and analysis to also telling the stories of victims of domestic violence, cannot be underrated at a time when people often become statistics. 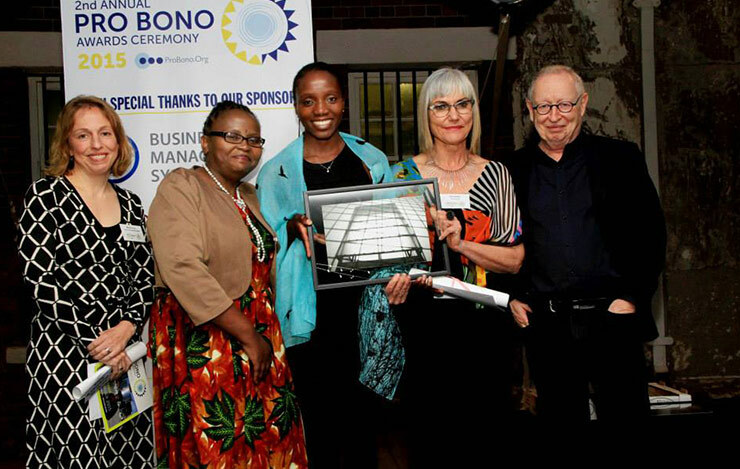 Writing for a magazine which targets the legal profession, Nomfundo has played a crucial role in cultivating an awareness of and enthusiasm for pro bono work amongst its members. 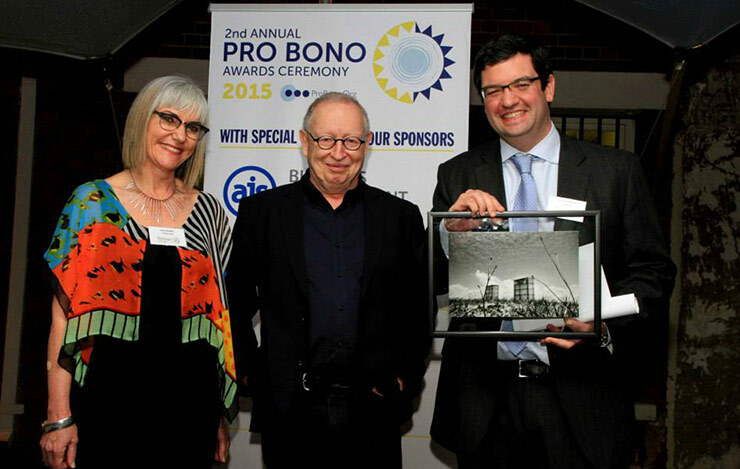 She has written countless articles on pro bono work, its importance, and how to go about it. In this way, Nomfundo, as a legal journalist, has also played an integral role in access to justice for poor people in South Africa. Patrick Bracher of Norton Rose Fulbright SA, for his 8-year commitment to hosting ProBono.Org’s Constitutional Law radio programme every fortnight on Radio Today. Christine Jesseman for her service on the Board of ProBono.Org and her exceptional role at DLA Cliffe Dekker Hofmeyr in promoting and actively assisting pro bono matters. Hoosen Sader of Saders Attorneys, for his long-standing and lifelong dedication to pro bono work, which started during the apartheid years and has continued unabated. Teresa Swart, Magistrate at the Germiston Children’s Court, for going beyond the call of duty in ensuring that children in her court are treated with respect and dignity and are properly represented. Alfred Wolpe of South African Mediators cc, for his involvement in providing pro bono mediations and training for ProBono.Org and our beneficiaries for the past 8 years. The Ford Foundation took the plunge earlier this year by contributing significant funding towards this inaugural Pro Bono Awards Ceremony. We greatly appreciate their firm commitment to the work of ProBono.Org, as well as to the importance of this event for the legal profession. Legal publishers Sabinet, Juta, LexisNexis, Legalbrief and Without Prejudice all provided financial sponsorships, as well as in-kind trade sponsorship. 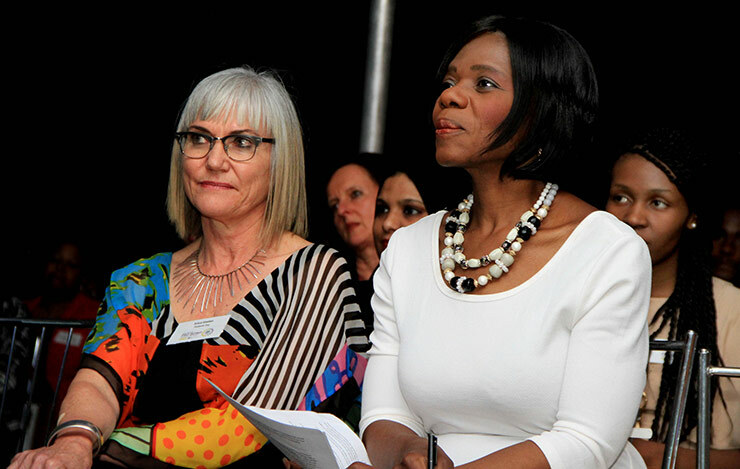 Legal Aid SA and 8 Johannesburg-based law firms (Bowman Gilfillan, ENS, Cliffe Dekker Hofmeyr, Fasken Martineau, Hogan Lovells, Norton Rose Fulbright SA, Webber Wentzel and Werksmans) all provided financial sponsorship. Katy’s Palace Bar provided the grand and spacious venue at a heavily discounted rate and Spier donated cases of red and white wine. Michele Dean of Limeblue for the design work and beautiful photographs; Lloyd Piater of The Natural Agent for the digital expertise; Freshly Minced for organising the event with such excellent and calm efficiency; and The Principality for their PR and media services.